‘Climate change and citizens’, the CSC’s second lecture series event, took place on Wednesday 6 May 2015. Hosted by the University of Sussex, the second lecture in this series focused on the issues surrounding climate change. The presentations explored the research into climate change, as well as the challenges facing academics and communities in reducing risk, mitigating impact and adapting to the realities of climate change. The lecture featured a keynote speech from Professor Dominic Kniveton, Head of Department at the School of Global Studies, and Professor of Climate Science and Society from the Department of Geography at the University of Sussex. Alongside the expert academic keynote, the lectures give Commonwealth Scholars the opportunity to share their research, expertise and experience. The first Scholar speaker was Donnex Mtambo, a Commonwealth Scholar from Malawi. Donnex is currently completing a Masters in Climate Change & Development at the University of Sussex. The final speaker for the lecture was Martin Munene Brown. Martin is a Commonwealth Shared Scholar from Kenya and is studying Disasters, Adaptation and Development at King’s College London. Over 50 Scholars and Fellows attended the event, with fantastic discussions following the presentations. Listen to the lecture podcast on CSC Radio below. Photos can be found on the CSC Flickr page. 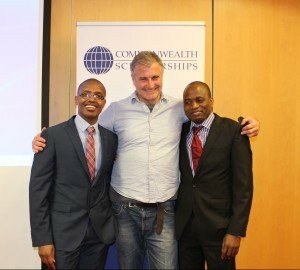 The CSC’s lecture series explores a wide range of subjects, bringing together academic and professional speakers with Commonwealth Scholars and Fellows to explore important issues. Throughout the events, Commonwealth Scholars and Fellows have the chance to consider, question, and share opinions on these topics, and to network with other award holders and guests. For more information on the CSC’s events, please contact the engage@cscuk.org.uk.